Ian Waldram reflects on the hazards of the offshore oil and gas industry. It is a tragic fact of life that our calendar year features innumerable anniversaries of fatal workplace accidents. Recently, members of the Institution of Occupational Safety and Health (IOSH) joined others in commemorating the 25th anniversary of the Piper Alpha disaster. On July 6, 1988, a huge explosion and fire killed 165 men on the North Sea oil production platform, as well as two of the rescuers. It remains to this day the worst offshore disaster in UK history. The report of the subsequent public inquiry by Lord Cullen was damning. Cultural, regulatory, procedural, communication, leadership and inherent design failures all contributed significantly to the catastrophe. The lessons of Piper Alpha remain as relevant today as they did a quarter of a century ago, not just in the UK, but in the Middle East and beyond. Many IOSH members work in the offshore industry today and are responsible for managing safety on rigs, platforms and construction vessels around the world. 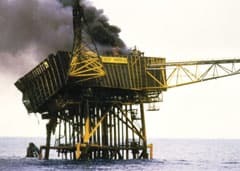 It can be tempting to believe that in areas such as the Middle East where the weather, water depth and distance from onshore support pose fewer design and operational challenges than in the North Sea and even deeper basins, that Piper Alpha is not so relevant, but this would be misguided. When the Piper Alpha disaster began there was a specialist fire fighting vessel close alongside and the weather was unusually calm, yet despite this the platform started to collapse about an hour after the initial leak - and within less than three hours it had largely vanished. For many who were in the industry at the time, July 6, 1988 is imprinted in their memories. We all know where we were and what we were doing when we heard about Piper Alpha. The shock of realising that a complete production platform, and the majority of people on it, could be destroyed so quickly was profound - not least because when you have lived and worked on such an installation it appears solid and immovable. Such personal memories are too strong to be forgotten. With the huge expansion in offshore activities, such as those in the Arabian Gulf and North Africa, there’s a real challenge to ensure lessons are also learned by those who entered the sector after 1988. These lessons have big effects on installation design, planned and unplanned operations, maintenance and emergency response. The industry therefore needs highly competent people who understand the lessons of Piper Alpha in all of these areas. So that all hazards are kept under control, complex processes and procedures must be in place that can at times be cumbersome and slow moving, to ensure planned actions are checked before they are implemented. It can be tempting to cut through such bureaucracy and ‘just do it’, particularly when the rewards of continued oil and gas production are so great for the government and taxpayer as well as all the businesses involved. Since Piper Alpha, other UK and international disasters have emphasised many of the same lessons. Not all involve oil and gas hazards, but all have similar lessons, such as Exxon Valdez, 1989; Columbia, 2003; Texas City and Buncefield, 2005; Nimrod, 2006; Montara, 2009; Macondo, 2010 and Fukushima, 2011. There have been many others, but these events in particular have been forensically examined, with the resulting national inquiries and reports published and made available for all to learn from. I recently attended the Piper25 conference in Aberdeen. The international event was designed to review, reinforce and reenergise the oil and gas industry, as well as provide reflection, with many concrete examples of what has been changed and improved since Piper Alpha. In the UK, progress has included the introduction of goal setting legislation for safety and health on platforms as well as a Safety Case regime, in which duty holders must demonstrate they have identified the hazards and risks within their operations, and have robust safety management systems in place to adequately control hazards to the regulator’s satisfaction. The Piper Alpha disaster also led to the creation of the Health and Safety Executive’s (HSE) Offshore Division as the independent regulator for the sector, and later the Step Change for Safety initiative, which was set up in 1997 aiming to make the UK the safest oil and gas exploration and production province in the world. Developments have indeed helped to improve health and safety performance in the UK offshore industry. Many conference speakers, however, also emphasised the need for “a chronic sense of unease” as a necessary element in managing major hazards, and to ensure we don’t have new accidents for old reasons. As outlined in the following sections, for the UK offshore oil and gas sector there are currently a number of areas of potential unease. Accidental gas and oil releases have occurred that are known to be at least as large as the initiating event on Piper Alpha. Reducing all accidental releases is an agreed industry target and they have indeed been cut by 50% in the past three years. Despite this, however, there were still 46 accidental releases in 2012 alone, which is significantly more than in the Norwegian sector. Many assets are past their design life. This is not a concern in itself; for example, the London Underground recently celebrated the 150th anniversary of its first operations, but ageing assets do require additional inspection and maintenance. This can be hard to provide when bed space is fixed. In addition, maintenance backlog isn’t a key performance indicator in every organisation. The HSE’s KP4 project, targeted at installations at or beyond their original design life, has successfully raised overall standards, but continues to reveal performance variations between different duty holders, and sometimes between different installations within the same duty holder. The sector is global and dominated by contractors. When safety critical activities are largely outsourced, e.g. reviewing and updating a Safety Case, how does the legal duty holder maintain enough internal skills to be a competent client? When independent contractors are employed for their specialist skills, such as on a drilling rig, are the required organisational competences always fully assured before and during joint operations? For regulators, how can the required competences and resources of smaller, newer operators be assured before they are permitted to undertake key operations, e.g. those with very significant oil spill consequences, where intensive 24 hour emergency management and response may be required, as at Montara and Macondo, for weeks and even months? There can be further common practises and processes; for example, work permit documents and internal audit practises, which are not yet standardised. Verification of the defined performance standards for safety critical elements, which are a key building block within each Safety Case, can be poor. Ensuring, for example, that air inlet dampers to the temporary refuge really do close when activated is a constant cause of enforcement action by the HSE. Smoke ingress to the accommodation was a significant issue in the Piper disaster. Are resources devoted and well balanced for managing and monitoring both the high consequence, low probability risks of process safety, as well as the lower in consequence, but more frequent issues of personal safety? Although the conference’s emphasis was on the former, all speakers at Piper25 agreed that both are important. There are a number of occupational safety and health hazards to which workers on offshore installations are exposed when drilling for, or producing, oil and gas. Types of work range from hotel and catering services, office work, power generation, maintenance, machinery and chemicals’ handling, cleaning, laboratory work, lifting operations, transferring supplies, dealing with waste, and construction tasks including working at height. The most significant risks, although not the most frequent, arise from major hazards, which can result in large scale fatalities and damage. In the worst cases this can even lead to the loss of the whole installation, as with the Piper Alpha and Deepwater Horizon disasters. These major hazards can be broadly grouped under fire and explosion, structural collapse, and loss of stability. While many of the occupational hazards are similar to those at any industrial site, offshore locations also have to handle additional challenges such as extreme weather, helicopter or boat transfers and limits to bed space. When an incident occurs you have to react with the personnel and systems on the installation - you can’t simply call the ambulance or fire service and expect them to take over as they can for many onshore locations. On site emergency response must be well thought out and thoroughly practised. Rigorous planning and logistics must be applied for both major shutdowns, modifications and the more routine daily activities. Because space is limited, one task can impact on another. As such it is a real challenge to make the required work permit system sufficiently robust, yet not so complex that users make mistakes or take shortcuts - as was the case on Piper Alpha. Offshore exploration and production is a complex and highly hazardous activity, requiring many structured controls of both the installation and its wells. The health and safety management systems of the operators, collaborating with contractors, must be suitable to manage a very wide range of health and safety risks. North Sea exploration and production operations have an enviable health and safety record and are widely acknowledged to operate many global best practises, but there is always opportunity for improvement. One thing is for sure: the offshore industry needs to continue to be proactive about its health and safety in order to drive standards and prepare for the future. Strong safety culture and appropriate health and safety processes are essential and these must be rigorous to account for the complexity and variety of hazards in the industry.